NEW YORK, NY—It was an ogre of a job, but Scharff Weisberg handily embraced video and lighting support for Shrek the Musical on Broadway. 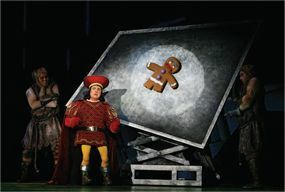 The popular show is a production of DreamWorks Theatricals and Neal Street Productions Ltd.
Scharff Weisberg handily embraced video and lighting support for Shrek the Musical on Broadway. Shrek and the production team behind his Broadway musical," notes Josh Weisberg. "These folks have pulled some nifty tricks out of their hats using three Panasonic PTD10000U 10K video projectors and a FLED 11io 11mm LED wall we provided. And, of course, the only media server the big, green guy would want on his show is a quartet of Green- Hippo Hippotizer V3 HD media servers." "This show was built very organically: I didn't come to Scharff Weisberg with a clear outline or structure," says Laura Frank, media associate and programmer working for set designer Kim Hatley and lighting designer Hugh Vanstone. "I knew my clients really wanted to evolve projection and the use of media onsite. We had to create a working environment and have tools available to work fast and meet demands in real time instead of having projection design rendered out. Scharff Weisberg set up a real working environment for me where I knew what the system was doing at all times and was never stressed with the behavior of the technology." Frank helped configure and create the content as well as program the control system. "Media content includes projected imagery that is predominantly scenic and lighting support from the projectors on the FOH rail," she explains.